The story of Elmer the Flying Monk is well known in Elmer's home town of Malmesbury, where his daring and initiative are still celebrated today. Elmer was a young monk with a curious and scientific mind, who wondered if it would be possible for a man to fly. He was ahead of his times in many ways. This poem by Paul Perro, written in 2009, tells the story of the young monk's attempt at flight in a fun way, that children will enjoy. When you have finished reading the poem, please continue to scroll down for some interesting facts about Elmer. A man who flew high as the sun. And they should come and see. Of the tower of the local Abbey. That carried him in flight. And he landed in some mud. When they heard the crashing thud. To where poor Elmer lay. And he said “I’m okay! And this time I won’t fail. Elmer (sometimes known as Elmer, or even Oliver) was an 11th century Benedictine monk who lived at Malmesbury Abbey. He was a keen astrologist and had a scientific mind. He saw Halley's Comet twice in his lifetime and somehow realized that it was the same one. Elmer did manage a short flight from the tower of Malmesbury Abbey, using a wings he had made himself, strapped on to his arms and legs, in around 1010 AD. He had studied the flight of birds and was aware of the importance of using currents of air. 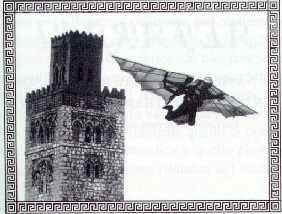 It is estimated that he flew for just over 200m, and was airborn for about 15 seconds. The flight started well, but he either panicked or got caught in a gust of wind, and came down with a crash. He broke both legs when he landed. In later life he used to say (possibly in jest) that he should have added a tail for stability. When he had recovered, Elmer wanted to attempt the flight again, but the abbot would not allow it. He went on to become a distinguished scholar, but always walked with a limp. Elmer had been inspired by the legend of Daedalus, the mythical Greek architect who designed and built the famous labyrinth in Crete (the one that supposedly housed the minotaur) for King Minos. Minos wanted to keep the labyrinth a secret, so he imprisoned Daedalus and his son Icarus. Being a clever engineer as well as an architect, Daedalus devised an escape plan - he built giant wings using feathers and wax, and he and Icarus flew to their freedom. Unfortunately though, Icarus got carried away, and flew too near to the sun, which melted the wax, and he fell to his death. We know about the story of Elmer the Flying Monk because of the writings of another monk, William of Malmesbury, about a hundred years later. William would have heard the story as a young man from the older monks who had been around at the time. The tower that Elmer flew from no longer exists. The present Abbey was not built until nearly 200 years after Elmer's flight. A stained glass window showing Elmer holding a pair of wings was installed in Malmesbury Abbey in 1920.